As someone who isn’t much of a fan of sake, I was quite nervous for this event. However, as I walked into Café Diner on Nayamachi Shopping Street, I was greeted by an extremely fashionable interior, many friendly faces, and a refreshing glass of water (thank goodness, since I wasn’t quite ready for a shot of sake at 3 PM in the afternoon). After mingling with the other guests, the event began promptly at 3:30. Koji Yamamoto, a son of a local, family-owned sake business in Fushimi called Shinsei was the guest speaker of the event. 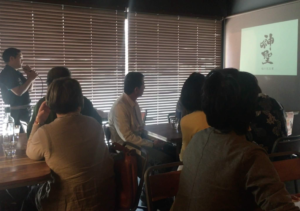 The title of his presentation was, “The Way to Enjoy Fushimi Sake,” which got rid of any remaining nerves and left me feeling hopeful. First, Mr. Yamamoto introduced himself and his family’s business. 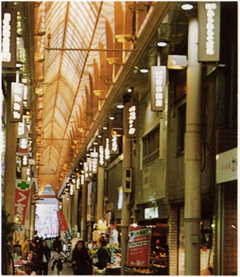 Shinsei was founded in 1677 and has been passed down for eleven generations. However, in 1868, due to the Battle of Toba-Fushimi, their company was burned down. 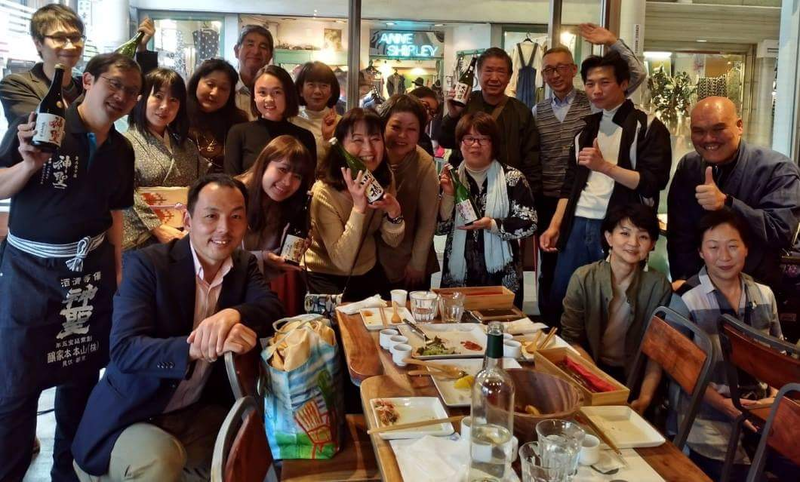 After reviving their business and overcoming that misfortune, their sake has won numerous awards: the Kura Master Platinum award, the London Sake Challenge award, the Kan Sake Award (2015 & 2016), etc. Being nearly a 350 year old company, one might wonder why this family, sake business has been able to be this successful for so long. Mr. Yamamoto quickly explained why in the next few slides of his presentation. 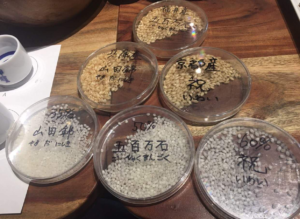 Sake’s quality relies heavily on two things: water and the polishing of rice. The reason why Shinsei sake’s flavor is award-winning is because of Fushimi’s groundwater. Water can be evaluated based on a spectrum ranging from “soft” to “hard.” For example, rainwater is “soft” while mineral water is “hard.” Fushimi water is “medium-hard” due to its balance of elements such as potassium and calcium which happen to be the perfect quality and composition for sake-making. Mr. Yamamoto illuminated this fact by having us taste-test two cups of water: Fushimi water and “super hard” water. The difference was clear and helped me understand why most people prefer bottled water to tap water. Next, he explained the importance of polishing rice. Rice polishing involves the removal of the outer layer (husk) of a rice kernel. The more that is removed, the cleaner and more refined the remaining rice is. When buying sake, there is a percentage that can be found on the label of the bottle. This percentage can sometimes be mistaken for an alcohol percentage; when in reality, it is the rice polishing ratio. The percentage represents the percent of rice remaining. Therefore, the lower the number, the purer the sake is (which means it is of higher quality and most likely more expensive). Finally, it was time to start tasting Fushimi sake! However, before pouring everyone a glass of sake, Mr. Yamamoto left us with some sake-tasting tips: the first tip involved tasting with one’s eyes. The color of sake can range from clear to slightly yellow. 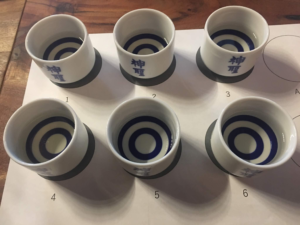 If one pay’s close attention, the color of sake can help one predict its flavor. The next tip involved tasting with one’s nose. Although one might not always notice it, sense of smell greatly affects one’s sense of taste. Different sake have different smells that affect their overall flavor. The final tip involved tasting with one’s tongue. Certain areas of the tongue are more sensitive to specific flavors: such as, sweet, salty, sour, and bitter. All of these taste receptors are important in regards to tasting sake, so Mr. Yamamoto recommended that we sip the sake in order to allow air to spread the sake throughout our mouths and over our tongues. 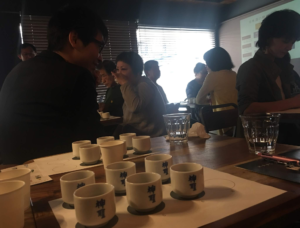 The remainder of the event we tasted six different types of sake (all produced by Shinsei), ate delicious food provided by Café Diner, and shared opinions regarding the sake with fellow taste-testers. At the end of the night, we were given two final shots of sake labeled “A” and “B” in which we had to guess which sake they were, out of the six different sake we had sampled throughout the evening. My guesses were that sake “A” was the fifth sake I had tasted, and that sake “B” was the second sake I had tasted. I was one of three whose both guesses were correct! As an amateur sake-drinker, I was quite proud of myself. This event surpassed all of my expectations. I left having learned a lot, having met a lot of amazing people, and having a newfound love for sake.